Satellite TV has come a long way! In the early 1980’s, the founders of Dish Network were hauling an enormous C-band TV dish antenna via pickup truck to a customer in remote Colorado. In the early 1980’s, this was one of only two dish antennas owned by the developing new business. A powerful gust of wind whipped up, blowing the antenna off its trailer and into a roadside ditch. There went half of the company! They overcame this setback to build what is now a Fortune 250 company that employs thousands and serves millions throughout the nation! Widely considered the industry leader in technology, DISH’s award-winning innovations include: Hopper with Sling® Whole-Home HD DVR that gives customers the ability to watch live and recorded TV programming from smartphones, tablets and computers; and the Tailgater®, a lightweight, portable satellite dish ideal for watching TV while tailgating, camping, in the RV or at outdoor activities. 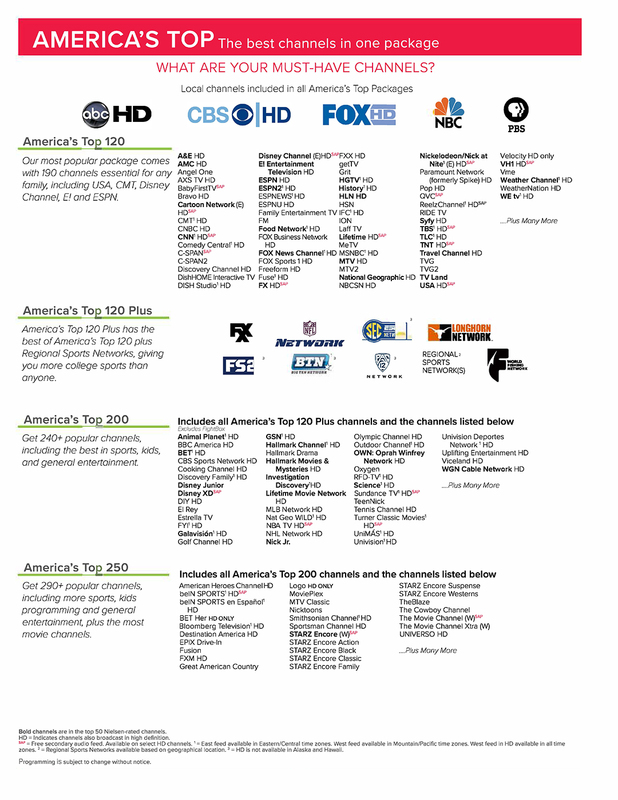 When choosing Dish Network, the two factors to consider are programming and equipment. DISH’s cutting-edge Digital Video Recorder (DVR) technology delivers just what you need no matter what type of TV setup you have. Our DVR receivers range from our Hopper Duo, designed to support one or two TVs, to our cutting-edge Hopper 3, which supports up to seven TVs and lets you record up to 16 shows at once — and even skip commercials! You don’t need DVRs all over your home, even if you watch TV in multiple rooms. 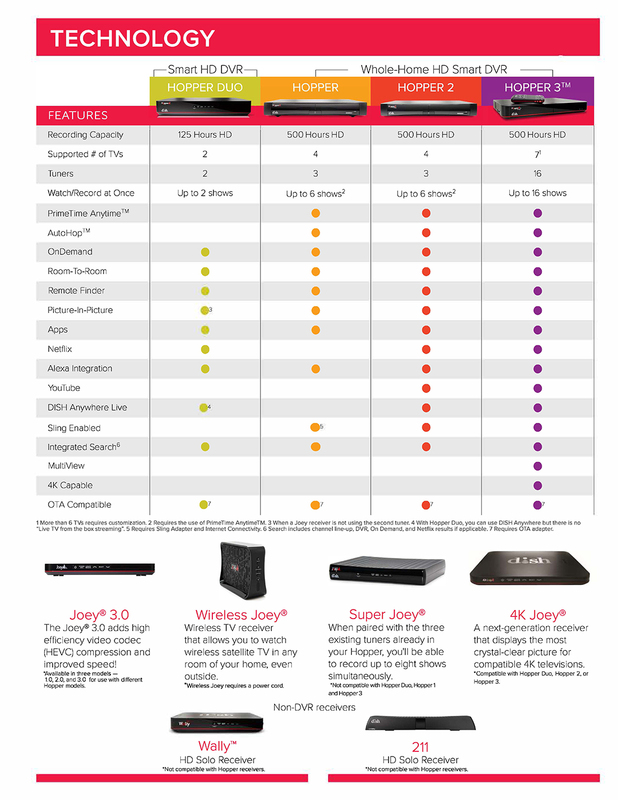 Your Hopper DVR records your favorite TV programming which can then be watched on Joeys, which you can set up with any TV in your home. We even offer Wireless Joeys so you can put TVs in hard-to-reach places. Our remotes are some of the easiest to use in the industry. We even designed them to look nice and feel good in your hand while being simple to use. Surf, search, record, and use apps at the touch of a button. Or, with our voice remote, just say what you want and let the remote do the work. 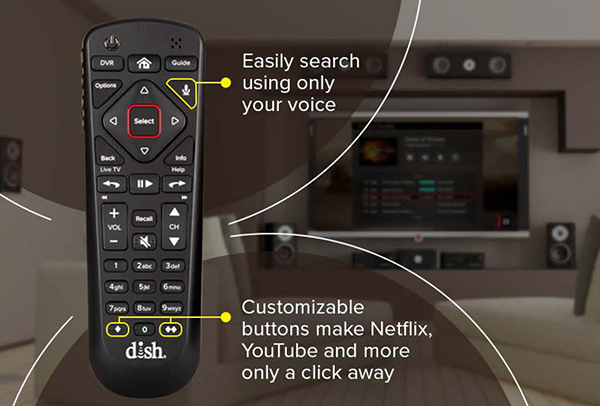 Search Live TV, On Demand & Netflix with the touch of a button.